Camden: Ladybirdz mobile beauty therapy has many clients in Camden and I absolutely love the area. Camden: Ladybirdz mobile beauty therapy has many clients in Camden and I absolutely love the area. It is always vibrant and buzzing with colour, tourists, niche shops and character buildings. 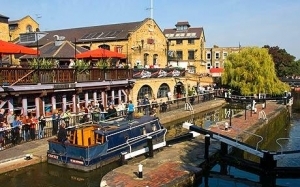 Camden has a famous market right on the Lock, normally weekends and summer days this area is heaving with people grabbing a coffee, watching the boats, relaxing, reading the papers or just meandering through the market stalls selling various clothes, shoes and all sorts of nik nacks. Camden is well known for all of its busy bars and pubs, one being the famous Hawley Arms which was Amy Winehouse’s local pub which had severe fire damage back in Feb 2008. Other famous bars and pubs would be the massive Worlds End which is right outside Camden tube station. and houses everything from teens barely drinking age to goths and labourers. Proud is the epitome of cool. You can find it within the Stables Market where they have made it a luxurious venue with class and comfort in mind. Camden is also well known for its people with alternative fashion sense to say the least. Burlesque is huge on the scene in Camden and if you ever want to buy a waist cincher or a corset this is definitely the place to get one. Goth is another very popular alternative as is fetish, 50’s and 60’s dresses which Ladybirdz thinks is truly fantastic and funky, punk and clubwear. Ladybirdz proudly offers its full treatment list within in Camden and the whole of NW1 and its surrounding areas. With a high number of its clients in Camden and popular treatments including pamper parties, massage, pedicures, eyebrow shaping, eyelash tinting, manicures, Bat Mitvahs and spray tanning. I will travel to your home so you can relax and enjoy your pamper treatment in your own surroundings, so why not call Ladybirdz now!